Well imagine that, Van Halen are having a bit of turmoil! Rolling Stone reported late this week that the classic rockers are “postponing” 31 shows. No one would say why, but a “source” close to the band said that “they hate each other” and that they can’t stop fighting. Apparently they can’t even stop fighting to count all that money. The band is currently still performing, but band reps let everyone know that after their June 26th show in New Orleans, the band isn’t going to play anymore shows. But will the fans who bought tickets get to see the band? Or see their money back? No one is talking in either the Van Halen-camp or the Live Natio-camp (Live Nation being the evil Corporate overlords). Quick! Someone explain to Van Halen how capitalism works: You have a product, we pay for it…then you give it to us. 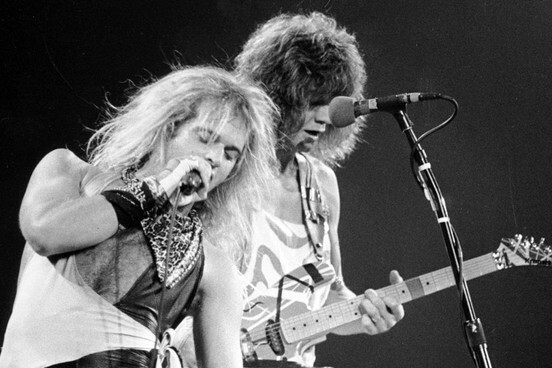 I, for one, am full of regret that I missed Van Halen when they recently rolled through St. Louis (I was at another concert) because I only heard awesome things. Still, are we really surprised that Van Halen aren’t getting along and might back out of a mega-comeback tour? The band is a potent concoction of “we hate each other.” Podcaster Adam Carolla likes to ask Rolling Stone writer David Wild about the untold millions dunder-headed rockers leave “on the table” just because they can’t sack-up and get along. I have no idea how much money Van Halen stands to lose if they don’t play these 31 remaining shows, but I’m sure it’s a phenomenal amount. The Rolling Stone article quotes a promoter as saying that the shows have been selling really well, so the notion that the band is pulling out of the concerts because they aren’t selling enough tickets isn’t the case. UPDATE: I forgot to bash Wolfgang Van Halen in this post, for that I truly apologize. In order to correct this oversight, let me just say that this is most likely all Wolfgang’s fault. The band postponed these shows because Wolfgang is fat. I’d like to say that I would stick it out and tour with people I hated for millions upon millions of dollars…but my track record is pretty sketchy. I’d honestly prolly do the same thing. Ha! I hadn’t thought of that. I know someone who is seeing them in 2 days…I can’t wait to hear how the show goes.